Hello again friends. As promised, I’ve split summit day into the climb to the top and the climb back down in the interests of making each post manageable. There was still far too much to relate about my New Year’s eve after the summit, that you are now faced with needing to read a second post in one sitting (depending on your addiction to all things ActiveSteve :-). Of course, the map and pictures are the same as last time, so no need to review those unless you want to. This part of the story now takes you from the summit at Uhuru peak (way up there at 5,896m) down to Horombo Camp, situated faaaarrrr below at 3,700m. Yup, that’s right we’d be descending over 2.1km in one hike! Read on to learn more about that. So, just where were we? Oh yeah, that’s right, we’d just spent about 25 minutes at 5,896m, and decided we had better get back down without pushing out luck. I wanted to basically bomb it back, but was told that I could do no such thing while we were still up on the crater rim. The plan was to stick relatively close together at least until we made our way back once more to Gillman’s point. Luckily, that wouldn’t take nearly as long as it did the first time. In fact, it actually only took about 3/4 of an hour. In other words, we took half the time. Of course, at that pace it would still be a while before we could crash in our tents for a little bit. Oh, I didn’t mention that yet did I? The full descent plan was similar to on Mount Meru. The camp at Kibo was still set up for us while we had climbed. Porters were assigned to each of our tents to watch our gear, and sleep in them while we climbed. Once we got back down, the plan was that we’d crash in the tents for an hour or so, while lunch was prepared for us. 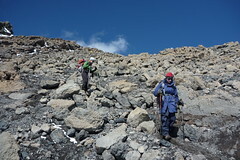 Once we ate lunch, we’d grab out gear, and make our way from Kibo to Horombo, 1000m below, but quite a long hike. Luckily it would be mostly downhill, so we could make good time. Anyway, once we hit Gillman’s point for the second time, Jody, Deb and I sort of sped up a bit as we picked our way through Jamaica Rocks. Another big change in this part of the hike was the weather. Specifically, I’m now talking about the sun. It was impossibly hot up here! I feel bad for complaining, but the fact is that it was now uncomfortably hot. Along the crater walk, I stopped a few times to scoop up snow and try and cool down my head an neck. I dared not take off my hat because I knew I’d probably automatically burn to a crisp. Also, I will mention at this point that while I had taken 3L of fluids with me on the climb (which at this point had already been over 9 hours), I wasn’t sure just how much I’d drank. Remember that point. Well, it was now time for one of my favourite parts of this hike 🙂 Scree! Everybody complains about scree slopes, because they’re so hard to climb up and a pain to get back down. Well, in my view, descending them is one of the pure joys on a volcano. I’d learned about, and gotten very familiar with scree slopes while I cycled around New Zealand and had the chance to climb several volcanos. While there, I’d adopted a pretty aggressive scree descent method, which was more or less like skiing down a steep powder run in the backcountry. With the poles, it was even more like that. You see, scree is very loose and slides under your feet. However, while sand is too loose and soft to use the slide, scree has some solid base, so you only slide on the top foot or so. Using that, you can really get into a groove heading down. I used that to full advantage on the way down. I still felt great, and wanted to have fun. Deb and Jody were also descending at a good clip with our guide, but I was in my own world and literally flew down the mountain. I did stop on a few occasions to wait for them and watch other people, but man was that fun. My fun was in direct juxtaposition to a lot of people we saw on the descent however. We passed one man who for all intents and purposes was unconscious. Two guides were basically carrying him down. We also saw numerous people that were completely out of it, and looked as though they’d collapse at any moment. Still other were collapsed, or at least stopped at the trail side and trying to be revived by friends and guides. It felt like a bit of a war zone. I was glad we were doing so well. In the case of some of these people, I wondered where their guides were, as they seemed to have been abandoned. Once again, I was thankful for the level of organization and attention our team had put into this. None of us was alone up here. Thank goodness. I was sure that the one fellow would be dead by the end of the day (people still die every year up on Kili). Scary thought, but not one I could dwell on. As mentioned before, the descent was far easier, since we were basically heading straight down the mountain rather that doing the switchbacks. About halfway down the slope, we stopped in order to take off as much clothing as we could. Jody and I even convinced Deb to just finish off the hike by stripping down to her long underwear, which was some pretty colourful stuff. I was down to my tights and undershirt, while Jody kept a little more gear on. What had taken us nearly 7 hours to climb up had basically taken us an hour and a half to descend. Wow! We were the first 3 to arrive back at camp, and to proceed to our tents to attempt napping. As soon as I got in the tent, the pain hit me. What pain? Well how about the most crackin’ headache I think I’ve ever had! It was all I could do to keep from crying. I was a little scared as I thought maybe it was altitude. However, a quick investigation into my water supply gave me the answer. I’d probably drank less than 2 liters in over 11 hours of hard activity, and just spent several hours in the blazing sun. Damn! I think I had a bad case of heat exhaustion, and there was basically nothing I could do about it. Regardless, I thought maybe my solution would be to get lower in hopes that would help me. As it turns out, I wasn’t the only one who needed that. Remember Mike and his turning back at Gillman’s? Well, he came back down, apparently extremely slowly due to his condition, and had been resting for few hours in the tent. However, when Naiman checked in on him, he was still not good. That was all Naiman needed. Next thing I knew, he was yelling for an ‘ambulance’, which up here basically means a stretcher with one big mountain bike tire on suspension attached. With it comes 5 African lads who basically run you down the mountain as fast as they can. You see, the best cure for altitude troubles is to get lower. The first line of defense from Kibo is getting from 4700m here to 3700m at Horombo, where you rest more and get re-assessed. There is no such thing as an airlift up here. So poor Mike was strapped in as tight as they could while in his sleeping bag. I had asked if I could descend with them, but Naiman said they would probably be too quick, and felt pretty certain I’d be okay to wait longer. Easy for him to say, I felt like absolute misery. Sleep was impossible, so I busied myself with packing up my gear so I could leave as quick as possible. I made a plea to the other guides to let me head down as soon as possible, but that never materialized. I kept trying to drink a lot of fluids, but that totally backfired. Deb kindly offered me some head meds of hers, and as soon as the second one hit my throat, I had to bolt out of the mess tent and vomited in a big explosion of bile and water. Thinking I might be better now, I went back to the mess tent. No such luck! I had to run outside twice more and basically wretched out all the liquid I had in me as all the porters watched with mild concern. Not fun. At this point, everyone else was stirring and heading to the tent for lunch which was now ready. I was told to eat something, but there was absolutely no way I could eat or drink at the moment. I just wanted to get out of there, unsure whether I could even physically do it. By the way, if your’re really observant and wondering, that is the reason both the GPS map, and my photo sets are lacking any sort of recorded data from Kibo down to Horombo. I didn’t have it in me to do anything, except, as is turns out, get myself moving at top speed. After lunch was eaten, and everyone was set, we set back out on the march. Sarah was pretty beat, and was in no hurry, and poor Jody also wasn’t feeling 100%. Dylan and John were pretty much just at their average, reliable pace and feel. Deb was a bit distant, and happy to follow whatever pace existed. The guide was going reasonably quick, which was fine for me while I could manage the pace, but too fast for others. At one point, he told me to lead. That was the last I saw most of the group that afternoon. As soon as I was in front, I just locked back into what I thought was the guide’s pace from before. However, I apparently pulled further and further away from the group. The wind was in my face, and I didn’t hear anyone calling me from behind (which apparently Jody was doing). I was completely in the racing and pain zone. In a long adventure race (anything after you’ve been up for 24 hours), you block out the world and just get it done, one foot in front of the other. That’s where my mind was (through the blinding headache). The good thing was that the other instincts that kicked in were my drinking and eating reflexes. As I pushed forward, I was drinking little sips all the way, and taking snacks from my pouches. Eventually, one of the guides caught back up to me and stayed with me for the rest of the hike. As we got closer to the end of the day’s hike, Deb was also pretty much with us. Apparently she had spent much of that leg just on her own, wrestling with her own personal demons I suppose, facing her own realities on the way. We were the first two to arrive at camp, and after unsuccessfully trying to register with a ranger, we grabbed our gear and headed to tents. The porters were pretty jovial and tried talking and joking with me a bit, and I tried to reciprocate, but in reality I just wanted to lay down and drink more, in an attempt at recovery. I felt pretty bad about running away from Jody on the way down, so I set up her half of the tent so that when she got in she could have a nap. Rather than sleep I just listened to music and laid there, willing the pain to go away. Eventually I sort of drifted into a semi-slumber, yet still aware of everything around me. I believe Mike was also undergoing very much the same. The good news is that by the time the porters were telling us the snacks and tea time were ready, I definitely felt an improvement. In the tent, I munched happily on the popcorn and nuts, and drank some tea. Supper was on tap within an hour as well, and I knew that there would likely be wine to celebrate, especially since it was New Year’s eve. There was also now the matter of figuring out all the tips, which is something I’d taken on again for this part, so I really needed to perk up a bit. Between snack and supper I rested again, and even cleaned up a little bit. Our final supper on the mountain was a bit surreal. We’d gone through a lot on the mountain, particularly in the last 24 hours of the journey. We once again raised our glasses and offered some toasts to each other in recognition and celebration of our accomplishments. We were all really glad to see that Mike also had made a recovery, meaning he wouldn’t be leaving and heading to hospital, which was the other option! We stayed up for a little bit, but once the darkness fell, and the tips were collected, we all pretty much just went to our tents to reflect and sleep. Although I desperately wanted to sleep, I had to stay up a bit and prepare each of the envelopes for the 28 crew members on our trip! I had bought envelopes before Kili just for this purpose. It would have been far too complicated trying to hand out all the tips at the end otherwise. Once that was sorted, I turned over, shut off my light, and basically had a sleep of the dead! There endeth the descent from 5,896m to 3,700m. With only one short day of trekking out remaining, our time in Africa was becoming very limited. What a day that had been. I’ve done some pretty long and grueling races, and while this isn’t on the same level, it was certainly one of the more amazing hikes that I’ve done. I was also very proud of Jody and her awesome job on the mountain! While she may not share all my passions for racing and training, she has a pretty amazing natural ability for these things. The fact that she was right there with me the whole way up and down is quite a testament to her strength. I was lucky to have her company on this journey, even though I didn’t always spend all my time with her. All that remains now is the final hike off the mountain, along with our final night in Africa. The story isn’t quite done, so you’ll have to come back to hear how it all ends. So, my thought of the day: A mountain is more than a mountain. It is a metaphor, it is a journey, it is a mirror, allowing you to reflect on yourself and your place in the universe. Never underestimate the impact that a mountain can have on your soul. Until tomorrow, keep dreaming kids!